We’ve lowered the cost of running the Sabarimala Virtual Q Portal by around 30% by using AWS Lambda, despite a 42% increase in portal users. Founded in 2006, India-based Saturn Systemwares provides various IT solutions and services such as web application development, enterprise mobility, and cloud management. Customers include multinationals, small to medium enterprises, and government departments. The business’ areas of focus include travel, transport, logistics, media, publishing, and advertising. With its broad range of expertise, Saturn Systemwares can provide customers with end-to-end solutions including design, testing, deployment, and support management. Sabarimala is a Hindu pilgrimage temple in the Periyar Tiger Reserve located in the Western Ghat mountain range in the southern Indian state of Kerala. Each year between November 15 and January 14, more than 30 million devotees visit the temple. To manage the huge crowds and the large number of visitors, the state’s police department—Kerala Police—engaged a consultant to come up with an effective solution. The consultant appointed Saturn Systemwares to develop a booking system to assign pilgrims specific time slots for their visits. The challenge for Saturn Systemwares was to create an online system that could cope with huge spikes in bookings. During peak periods, the number of bookings reaches 3,000 requests per minute, but this number decreases to zero out of season. This huge variation meant an on-premises solution was too expensive because the hardware would go unused for long periods during the year. Saturn Systemwares decided to run the online booking portal—the Sabarimala Virtual Q Portal—for Kerala Police on Amazon Web Services (AWS). As Jiju Thomas Mathew, chief technology officer at Saturn Systemwares explains, AWS immediately helped overcome the challenge of scaling compute resources in line with unpredictable demand. 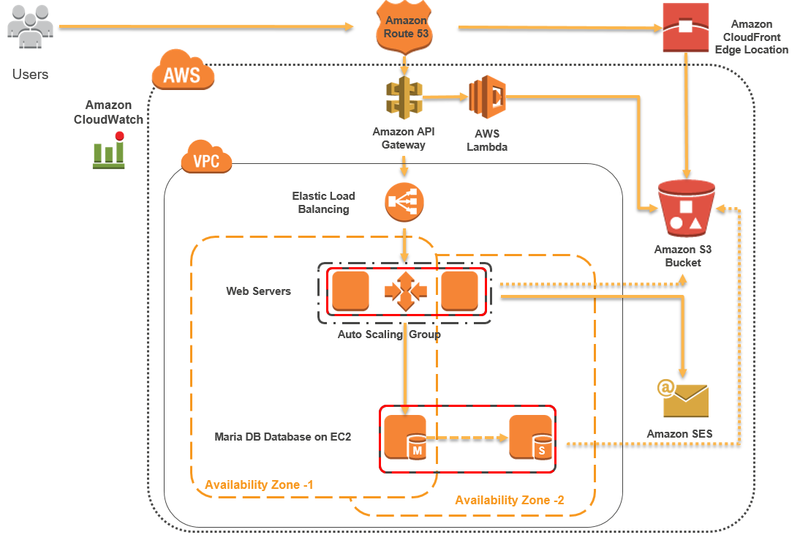 Mathew had prior experience working with Amazon Elastic Compute Cloud (Amazon EC2) instances and started using the service to run the portal code with Amazon Route 53 as the web service Domain Name System (DNS). The entire operation was run within an Amazon Virtual Private Cloud (Amazon VPC) with Elastic Load Balancing to distribute incoming application traffic. Mathew also opted for Amazon Simple Storage Service (Amazon S3) as a secure repository for user profiles and photographs with Amazon CloudFront to maximize data transfer speeds. Soon after, the business started using Auto Scaling to automate the scaling process and reduce costs. “We learned as we went along, but that was the great advantage of AWS. There was information available online to guide us, so working with AWS was very straightforward,” says Mathew. After the first year of using Amazon EC2 and Auto Scaling to support the portal, Saturn Systemwares began to incorporate more AWS services. The business began to use Amazon API Gateway to manage traffic with AWS Lambda, which significantly improved the efficiency of the portal, running code only in response to a request. It selected Amazon Simple Email Service (Amazon SES) for push notifications to customers. The company also adopted Amazon Relational Database Service (Amazon RDS) for MariaDB to log user activity and Amazon CloudWatch to help manage AWS resources. The Sabarimala Virtual Q Portal running on AWS is helping Kerala Police to provide a safer and smoother pilgrimage for millions of Hindus visiting the holy site. During the 2015 pilgrimage that ran from mid-November 2015 to mid-January 2016, around 1.6 million devotees registered on the portal. Today around 7.5 million people have successfully registered their details on the portal, uploaded a passport-sized photograph, and booked an entrance time to the temple. Registrants are issued a Virtual Q coupon with a QR code, which has to be produced at the entry point for identification and verification. Saturn Systemwares has been able to maintain a high availability of service at 99.9 percent throughout the period to avoid disappointing visitors and can now easily scale compute resources with demand. Since adopting AWS Lambda, the company has also benefitted from substantial savings. “We’ve lowered the cost of running the Sabarimala Virtual Q Portal by around 30 percent with AWS Lambda, despite a 42 percent increase in portal users,” says Mathew. According to Mathew, the billing system has been simplified thanks to AWS. “Our monthly bills from AWS for supporting the portal are passed on directly to Kerala Police. This means our customer is charged only for the services consumed, ultimately helping the department lower its IT spending,” says Mathew. During off-peak periods when activity on the portal shrinks to zero, Saturn Systemwares puts the AWS solution into “deep freeze.” As activity begins to pick up and visitors begin to use the booking feature of site again, Saturn Systemwares reactivates the AWS environment. “That’s the beauty of the AWS model for our service. It’s entirely flexible allowing us to meet our requirements,” says Mathew. Learn more about running websites on AWS.